MEXICO CITY -- Trade Ministers from Canada, Mexico and the United States say they made progress in talks to update NAFTA, but that progress didn’t include changes to difficult subjects such as rules of origin and labour standards. 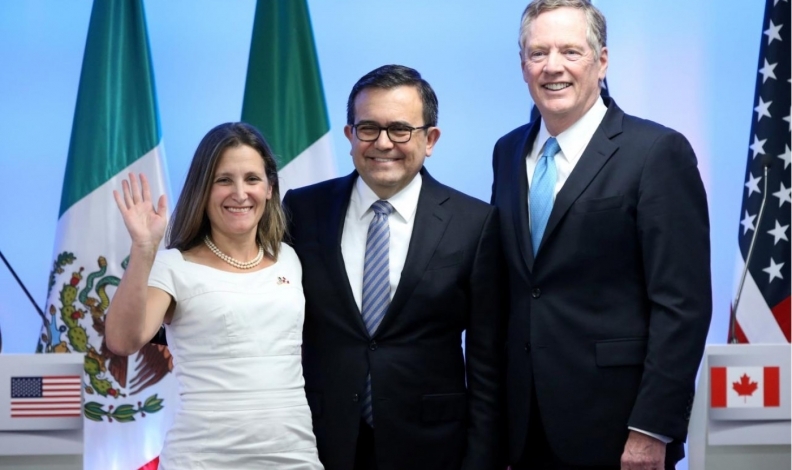 A trilateral statement issued by U.S. Trade Representative Robert Lighthizer, Canadian Foreign Minister Chrystia Freeland and Mexican Economy Minister Ildefonso Guajardo sought to quell concerns about the U.S. commitment to the North American Free Trade Agreement in light of U.S. President Donald Trump’s recent warnings he could terminate it. The trio announced a third round of talks in Ottawa for Sept 23-27. Guajardo said the more complex issues such as Mexican wages, local content rules and the U.S. trade deficit would be addressed in those sessions. Changes to dispute-resolution mechanisms hasn’t been addressed yet either. The United States did not make specific proposals on these issues in the five-day round in Mexico, Guajardo and Lighthizer said. One area of concern identified by lobbyists is Lighthizer’s stated objective of incorporating a U.S.-specific automotive content requirement, which they say could prove a major obstacle that delays the talks. Lighthizer said no chapter of the pact was completely wrapped up, but progress was made in consolidating language about small businesses, digital trade, the environment and services, among other things. The three ministers restated their goal of reaching a new NAFTA deal by the end of the year to avoid conflicts with 2018 election cycles in Mexico and the United States. Moving quickly to consolidate texts is paramount if they are to achieve that goal. It took five years and more than 20 negotiating rounds to negotiate the since-canceled 12-country Trans-Pacific Partnership trade deal. Freeland gave the most upbeat message, praising the working relationship between the three countries and saying they had established a good foundation for the future rounds of talks. Juan Pablo Castañon, head of Mexico’s influential CCE business lobby group, said negotiators had made headway on areas such as energy, telecommunications and investment, as well as improving conditions for small-and-medium-sized firms and streamlining customs procedures. “Important progress was achieved in many disciplines and the parties expect more in the coming weeks,” the trade ministers said. Another problem is whether Trump will find the final outcome acceptable enough to stay in NAFTA. Trump used the agreement as a punching bag during his election campaign last year and has repeatedly threatened to pull out of it, even after the modernization talks began on Aug. 16. Lighthizer said he was confident he could negotiate a deal acceptable to the U.S. president and that his goal was to negotiate a new deal, not pull out of NAFTA. Lighthizer has adhered to Trump’s line that NAFTA must be rewritten to reduce U.S. trade deficits of about US$64 billion with Mexico and US$11 billion with Canada and started the talks with strong demands for major changes. In his closing statement, Lighthizer said NAFTA must address the harm done to those in manufacturing industries and benefit all Americans. Critics say it has drawn jobs from the United States and Canada to Mexico, where workers are paid far lower wages. Supporters say it has created U.S. jobs and that the loss of manufacturing from the United States has more to do with China than Mexico. If NAFTA collapses, costs could rise for hundreds of billions of dollars in trade as tariffs are brought back. Free-trade lobby groups say consumers would be saddled with higher prices and less availability of products ranging from avocados and berries to heavy trucks.